The objective of this project was to promote and facilitate analysis and evaluation of the impacts of road construction activities in Smart Work Zone Deployment Initiative (SWZDI) states. 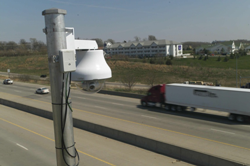 The two primary objectives of this project were to assess urban freeway work-zone impacts through use of remote monitoring devices, such as radar-based traffic sensors, traffic cameras, and traffic signal loop detectors, and evaluate the effectiveness of using these devices for such a purpose. Two high-volume suburban freeway work zones, located on Interstate 35/80 (I-35/I-80) through the Des Moines, Iowa metropolitan area, were evaluated at the request of the Iowa Department of Transportation (DOT).